This is the typical connection wiring diagram of the BeK3 AMF controller. Despite the fact that you can connect the current transformers closer to the generator, we recommend that you connect the current transformers after the mains and generator changeover breakers. This will allow you to read the current when the load is connected to the power utility. You can set a warning or a shutdown limit for the current. 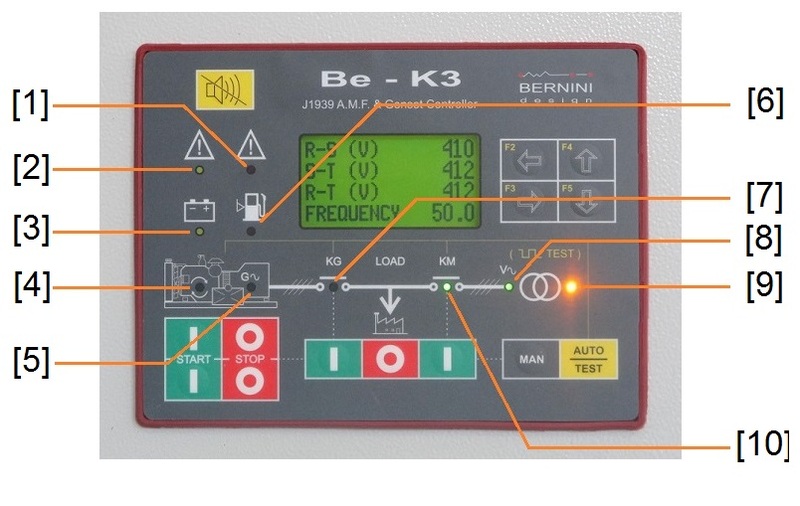 In this case the BeK3 will activate the alarm only when the load is supplied by the generator. We recommend to use contactors with mechanical interlock. This solution will avoid back-feeding in case of troubles of the controller or the driver relays. The BeK3 has a special circuit to supply the coils of the relays. This helps to hold the relays during crank. 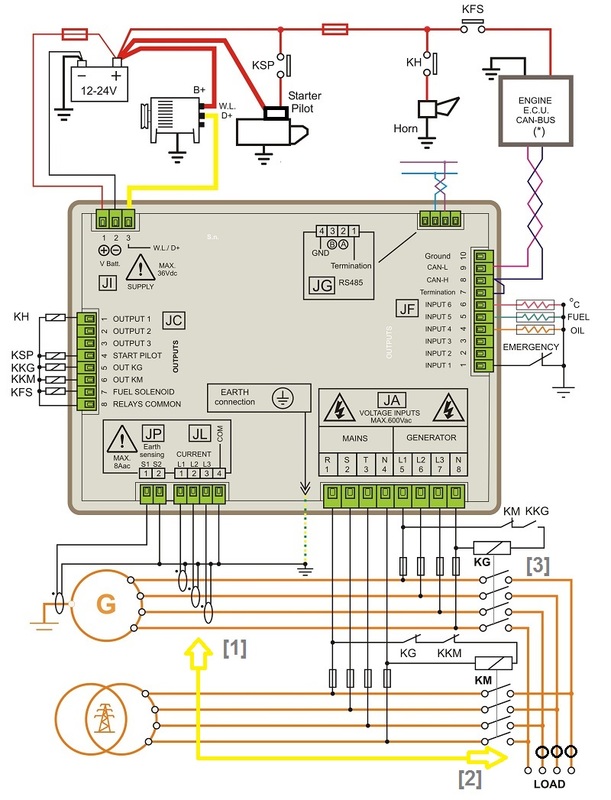 You are required to use automotive relay rated at 12Vdc in case the engine has a 12V battery. When using a 24V battery, you are required to use 24V rated automotive relays. The area indicated  is the alarm panel. The LCD displays is able to provide alarm information and log event record. By using the [ACK] push button you can silence the horn. The panel  allows you manual control of the engine. Two greed LED indicators inform you about the presence of the generator voltage. A green indicator informs you about the status of the engine. 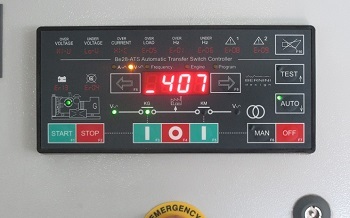 The panel  is committed to manually control the status of the circuit breakers. By using the commands  you can change the mode of operation. The indicators in the area  inform you about the presence of the utility power and generator together with indications of the circuit breaker status. The areas  and  contain the push buttons that allows you to navigate the display. The display  features very-well organized menus about instruments, parameters, alarms and miscellaneous information.